This photo hangs in my father’s bedroom. It used to be in the family room, but moved furniture required a new home, so it has pride of place above Dad’s dresser. 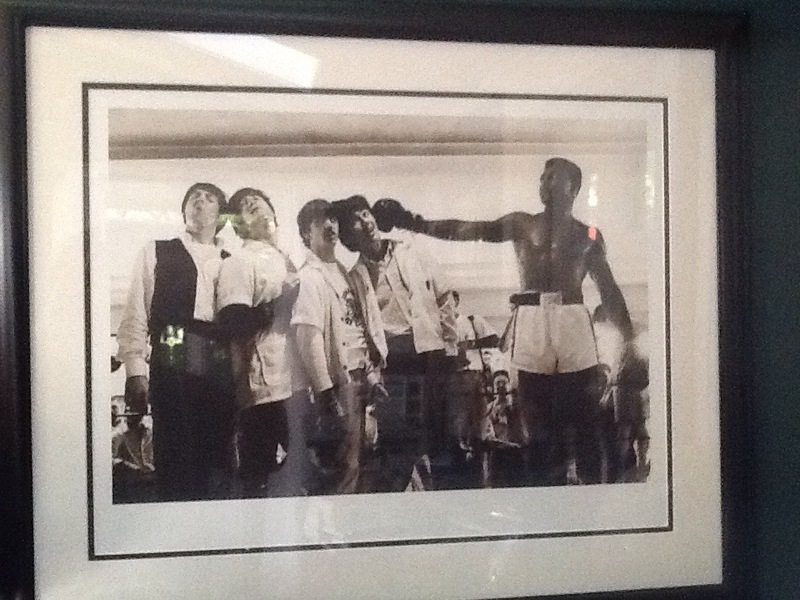 I love it because it represents two of the most potent figures of my childhood: The Beatles and Muhhamad Ali. There have been a lot of tributes written lately, and I was hesitant to add to it. Ali was largely hated by White America. Hated. He eventually won people over, but he was stripped of his titles and prevented from feeding his family because he refused to fight an unjust war. He was targeted by the FBI. He was not humble and deferential about this, the way that America wanted its pacificists or Negroes to be; he refused to be frightened into submission. Much of White American could not reconcile a man who was so prolific with violence in the ring refusing to engage in it for his own country. It did not matter that he had already won an Olympic gold medal for his country. It did not matter that he perfectly explained, time and time again, how hypocritical our nation was to ask African Americans to kill people overseas when they were being killed in their own neighborhoods by those sworn to protect them. Sadly, little has changed. I know, I know. Not all White people. Not all police. Not all. I know. I read one post written by an African-American woman that took umbrage to the opportunistic eulogies being offered by Whites who denounced all Muslims yesterday but are suddenly ready to put on bow ties and sell bean pies in honor of Ali today. She said that Ali was a hero to “us,” meaning African-Americans, not all Americans. I get that. I respect that. And I agree, almost completely. Yes. The most dangerous thing Ali did was dare to love himself when everything around him taught self-loathing. And he taught that to other persons of color. He found a faith that rooted him in compassion, and while he sinned like all of us do, he spent most of his time trying to be good, to do good, to spread good. So this piece is not meaning to suddenly jump on the Ali bandwagon and co-opt his legacy. But I grew up in a boxing household. I knew about Ali from a young age. My father, a lifelong pacifist, talked less about Ali in the ring than he did about Ali out of the ring. How his stance against Vietnam helped my father to come his own consciousness. My Dad has always admired Ali for sticking to his principles, even when it cost him heavily; from a young age, I was taught to respect Ali. I saw in his braggadocious behavior a man of incredible intelligence, a master of promotion and one of the most skilled pugilists in human history. Every time the Thrilla in Manilla or the Rumble in the Jungle would be replayed on the weekends by stations desperate to fill the new 24 hour cycle, Dad and I would park in front of the TV and watch the fight. Dad would tell me about the times, the feeling in the air, what Ali meant to a changing and ever-fearful America. When we owned a small movie theater in my hometown, Dad showed documentaries about Ali on 16mm. That was how I discovered Theolonius, too; but that’s for another blog. So let us not whitewash Ali the way we often whitewash King. Ali was a revolutionary. He was a bad, bad man. He was unapologetically Black, and he declared it beautiful. I don’t know if America is worthy to call him our own, but I pray that one day we will get there. RIP, Champ. Rest in Power. Insallah.